Please note the dispensary at Wendover Health Centre is open from 8.30am Monday to Friday and is open 9am – 11am on Saturdays. Saturday morning appointments pre-bookable only. All sites telephone lines are open from 8.00am – 1.00pm and 2.00pm – 6.30pm. FedBucks (should the practice be closed Monday – Friday between 1.00pm and 6.30pm for staff training) – 01296 850011. Please see the dates that the practice will be closed for training. 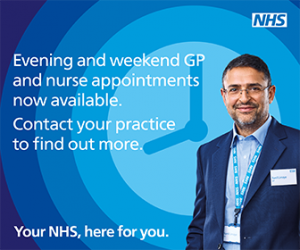 NHS 111 between 6.30pm – 8.00am seven nights a week – call 111. FedBucks is the name of your local out-of-hours service provider. The Out of Hours doctor is always available for emergencies, including nights, weekends and all Bank Holidays. A nurse or doctor will assess whether you need either telephone advice, an appointment or a home visit if there is an urgent need. We want to ensure that our patients are aware of what to do if they are ill or require medication when their GP Practice is closed.